They began tearing down the original New York Pennsylvania Station fifty-five years ago today. It was a mammoth undertaking that would go on for three years into 1966. When built in 1910 everyone assumed it would stand on the west side of Manhattan for the ages, and yet it lasted just barely more than half a century. In some ways it lasted less than half a century: a major renovation in 1958 had already obliterated much of Charles McKim’s original design. Penn Station’s destruction was a tragedy from which we have never fully recovered and yet its demolition made sense in a way. First of all it was private property, built by the Pennsylvania Railroad Company to tie Manhattan to the continental United States. Before Penn Station opened in 1910 passengers traveling eastward by rail had to disembark in New Jersey and ferry across the Hudson River. It was a perilous undertaking; the ferry boats zigzagged their way between other ferries, around tug boats, and dangerously close to the huge ocean liners that came into New York Harbor daily. The first act in the demolition of the original New York Pennsylvania Station on October 28, 1963 was the removal this eagle. It was one of twenty-two granite eagles that adorned the structure. The Pennsylvania Railroad Company, like all the major railroad companies, was hugely powerful and profitable. It would have been difficult to imagine when the station opened just a decade into the twentieth century that it and most other railroads would be rendered obsolete by the 1960s. By this time however, the highway were largely built. Trucks and automobiles, not locomotives, now moved people and products. For longer travel, why spend five days on a train when an airplane could get you there in five hours? Like Kodak after the invention of digital photography, the railroad company’s demise happened swiftly. New York City and the nation were fortunate Pennsylvania Station opened when it did. It proved hugely important to the Allied war effort, moving men and materiel across the country. Interpreted a certain way it can be seen as a triumvirate of public works projects done in time for the war: Pennsylvania Station in 1910, Grand Central in 1913, and the Panama Canal in 1914 just as the Guns of August began going off. On one day in June 1918 alone over 4,000 men were inducted into the U.S. Army and shipped off from Pennsylvania Station to training camps in various locales. Just a few weeks after his tragic plane accident John Purroy Mitchel’s remains were brought back from Louisiana on a train that pulled into Pennsylvania Station. Theodore Roosevelt, his health rapidly declining in that same summer of 1918, traveled to and from Pennsylvania Station on various trips out West to advocate for the American war effort. I could go on but one gets the idea. This eagle is one of four from the original New York Penn Station that was moved to Philadelphia’s Market Street Bridge after the destruction of the iconic Manhattan train station. Philadelphia Penn Station is in the background. Fourteen of the twenty-two eagles that once adorned New York Pennsylvania Station are still known to exist. A few remain in New York and others got sent elsewhere. Four of them decorate the Market Street Bridge in Philadelphia, which is where I took the photo one sees directly above a few summers ago. Yesterday I put the final touches on my upcoming talk this Sunday at Camp Doughboy on Governors Island about John Purroy Mitchel. Later I did a dry run for a friend in my department to work out the kinks. A dress rehearsal always helps with these things in turns of timing, avoiding ambiguity, and just making certain that are sufficiently clear. I am as ready as I am going to be. Gertrude Vanderbilt Whitney sculpted this doughboy statue in Upper Manhattan in 1923 and later founded the Whitney Museum of Art. Quentin Roosevelt was engaged to her daughter when killed in an airfight in France in July 1918. In part of the talk I discuss the ways the JP Mitchel is remembered in New York City. Mitchel Square at 168th and Broadway is just one memorial to the Boy Mayor. There too is this beautiful statue that we see above, which was not sculpted expressly for Mitchel himself but for the men on Washington Heights who fought in the war. I happened to be in northern Manhattan a few weeks ago on my way to somewhere else when I stumbled upon it. Yesterday after my walk through my friend and I were discussing Mitchel and breaking down some of the details of his life and times. Color me ignorant but I did not know that the statue in Mitchel Square was designed by Gertrude Vanderbilt Whitney. Gertrude was the mother of Flora Payne Whitney, Quentin Roosevelt’s fiancée. Of course Quentin himself died in a military plane incident above France just two weeks after Mitchel was killed in Louisiana two weeks earlier. Check out the schedule for Camp Doughboy 2018 here. I am having my coffee and a bite to eat before heading off to the Tomb. I see it is raining. It is too early to tell how it might effect the event at Sakura Park that runs from 12:00 – 8:00. I am watching the progress of Hurricane Florence as well. In addition to the terrible havoc it might unleash on many lives and communities, it may effect next week’s Camp Doughboy weekend on Governors Island. We will keep our fingers crossed that the Florence, and the storm building behind it, do not turn into major tragedies. I was gathering my notes yesterday for next week’s talk about John Purroy Mitchel and came across this political cartoon which I thought I would quickly share. It is from the August 9, 1915 Brooklyn Daily Eagle and, coincidentally or not, is positioned next to an article about Mitchel’s participation in the Plattsburg training camp that summer. The cartoon shows Theodore Roosevelt explaining the dangers of what he and his supporters called hyphenated-Americanism during the Great War. The United States was not yet in the war when this cartoon was published. This was, however, just three months after the sinking of the Lusitania. The tension between Roosevelt, General Leonard Wood, Mayor Mitchel and other Preparedness advocates against President Wilson was building. Just a few weeks after this cartoon appeared Roosevelt gave a controversial speech at Plattsburg taking the Wilson Administration to task for what he saw as its poor response to the war. General Wood was in attendance in Plattsburg with Roosevelt and later reprimanded by Secretary of War Lindley Garrison. Here is some stunning footage of John Purroy Mitchell’s funeral at St. Patrick’s one hundred years ago today. Note Theodore Roosevelt and, I believe, Charles Evans Hughes, who ran against Wilson in 1916, walking behind the casket as the pallbearers take Mitchel into the cathedral. The have my article up and running over at Roads to the Great War about the life, times, and death of John Purroy Mitchel. New York City’s Boy Mayor was all of thirty-four when he became mayor in 1914. Initially he was an ally of Woodrow Wilson, who in 1913 had appointed him Collector of the Port of New York. Men like Chester Arthur had previously held the collectorship. Mitchel and Wilson soon had a falling out over what the mayor saw as the president’s poor leadership during the war. Soon, Mitchel was very publicly allying with friends like Theodore Roosevelt and Leonard Wood advocating for Preparedness. When he lost his re-election bid, Mitchel became a military aviator. He died in a flight exercise in Louisiana on July 6, 1918, one hundred years ago today. John Purroy Mitchel, New York’s boy mayor, died 100 years ago this coming July. Mitchel was in office from 1914-17, thus overlapping almost entirely with the early years of the Great War. Mitchel was a proponent of Preparedness and as such became a natural ally of Theodore Roosevelt, Leonard Wood, and others advocating for American readiness to join the fight. After Mitchel left office he joined the Army Air Service and was killed in Lake Charles, Louisiana when he fell out of an airplane during a training exercise in July 1918. Friends dedicated a memorial to him in Central Park near 90th Street and Fifth Avenue in November 1928. For years, especially throughout the 1930s and 1940s, the Mitchel monument was a focal point of Memorial Day commemorations in New York City. 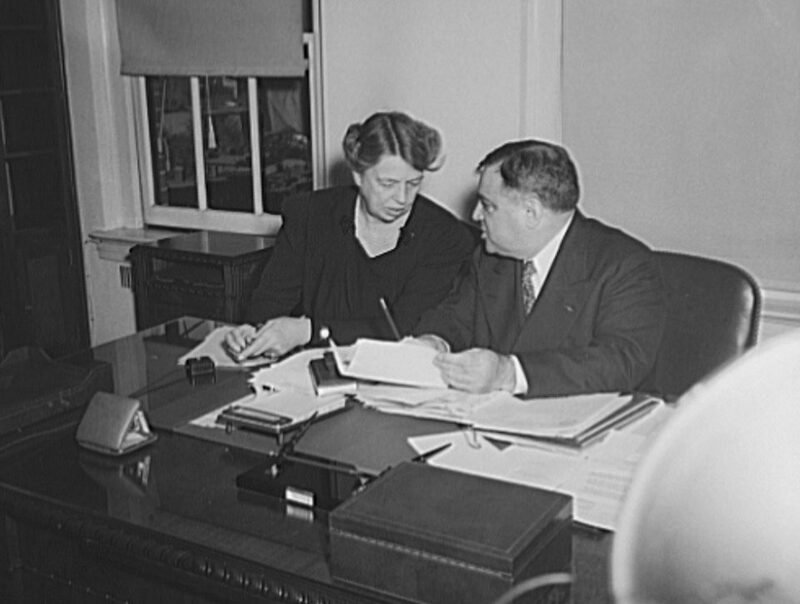 One regular attendee was Fiorello La Guardia, who over the course of his tenure in office from 1934-45 observed at least nine of twelve Memorial Days at the monument to his mayoral forerunner, Fusion Party associate, and fellow World War 1 aviator. New York Times, May 31, 1934: La Guardia is second from the right. The photograph above shows La Guardia at the Mitchel monument on Memorial Day 1934. This would have been just over a year into the FDR Administration and with the Great Depression in full effect. This was also La Guardia’s first Memorial Day as mayor. There were still Civil War veterans marching in New York City’s Memorial Day parades in these years, about 25 this year. In the years after this their numbers dwindled into the single digits. New York Times, May 31, 1944: La Guardia was pressing for full Axis surrender in the tense days before the Normandy Invasion. The headline here in which La Guardia advocates for an “aviator’s peace” comes from the 1944 Memorial Day observation. While obviously the public did not know the exact day that the offensive to liberate France would begin, Memorial Day 1944 took place one week before D-Day. Thus we see La Guardia pressing for all out victory. Poignantly, 1944 also happened to be the first year that a Civil War veterans did not participate in Manhattan’s Memorial Day observation. Brooklyn and Queens each had one G.A.R. veteran in the ranks. Spanish-American War veterans, doughboys from the First World War now well into middle age, and active duty servicepersons including WACS, WAVES, and SPARS were all represented. La Guardia was on hand again at the Mitchel memorial on Memorial Day 1945. He had gotten his “aviator’s peace,” at least in Europe. By Memorial Day 1945 V-E Day had passed and everyone was waiting anxiously to see what would happen in the Pacific. New York City mayor John Purroy Mitchel lost the Republican primary to William M. Bennett in his re-election bid in 1917. Unbowed, Mitchel decided to run as an independent. He had some strong supporters in his corner. Theodore Roosevelt, former Supreme Court Justice Charles Evans Hughes, and Henry Morgenthau among others turned out at City Hall Park on 1 October 1917 to “nominate” the incumbent in what they were calling a “popular convention.” Ten thousand people turned out that Monday to see the speakers, which turned out to be something of a detriment to Mitchel; some observers noted that many in the crowd were there more to see Colonel Roosevelt than the mayor. In his own address to the crowd Mayor Mitchel vowed that he would “make the fight one against Hearst, Hylan, and the Hohenzollerns. I will make the fight against Murphy, Cohalan, and O’Leary.” Mitchel’s quote was a reference to John Francis Hylan, the Tammany-backed Brooklyn Democrat supported by William Randolph Hearst and his newspapers. The 1917 mayoral election would turn out to be a bruising four-way campaign between the Mitchel, Hylan, Republican William M. Bennett, and Socialist Morris Hillquit. The race was a microcosm of America itself in Fall 1917. Over the course of the next five weeks the four mayoral candidates would argue the themes that Americans were hashing out around the country. That very day of the Treasury Secretary (and Wilson son-in-law) William G. McAdoo announced the opening of the second Liberty Loan Drive that would eventually raise nearly $4 billion. For the bond drive there was a big parade in Manhattan. Against American involvement in the war, Hillquit came out against the drive. The race was on until the election in early November. As August 1917 wound down the officers and men of what was now the 27th Division prepared to leave for Spartanburg, South Carolina. They were supposed to go several weeks earlier but bureaucratic snafus in the War Department prevented that from happening. Things were now as in place as they were going to get. Before the division left, the people of New York prepared a three-day fête to see the men off. On Tuesday 28 August about 500 people showed up at the Biltmore Hotel to honor Major General John F. O’Ryan, the division’s commander. There seemed to be a conscious attempt to play up the Irish aspect of the evening. Mayor Mitchel was one of the organizers and T.P. O’Connor gave the keynote. Broadway turned silent film star William Courtleigh was the master of ceremonies. The evening was quite reserved and understated; organizers were trying to Hooverize–conserve in the name of the war effort–as much as they could. It had been a hectic few days. Later the past week New York State’s attorney general had placed O’Ryan on the New York National Guard inactive list. This was because President Wilson and the Senate had appointed O’Ryan, and most all militia officers, in the National Army a few weeks back. That had put O’Ryan’s militia status somewhat in question. O’Ryan had spent much of this time visiting his regiments out in the field. Many of them were camped out in municipal parks. Brooklyn’s Twenty-Third Infantry Regiment for instance was training in Van Cortlandt Park in the Bronx. The time to move on was near and people were gathering. All of O’Ryan’s staff were on hand at the Biltmore dinner as well. The dinner was just the lead-up to what was to come over the following two days.